Standing at a height of 1,250 feet, the Sudbury Superstack is the second tallest chimney in the world and runner-up to the CN Tower for the tallest structure in Canada. Until 1987, Sudbury Ontario had the dubious honour of having the world’s tallest smokestack. Today, the Stack is seen by some as a marker for Sudbury’s rich mining heritage but for others, it is also part of a much larger history of health and environmental problems. “Sudbury and the Beast.” Courtesy of local photographer Greta Clarke. Since the nineteenth century, Sudbury’s landscape was ravaged by the effects of the mining industry; over the years the vegetation disappeared with acid rain, and farmers found themselves unable to grow crops in the highly acidic soil. The International Nickel Company (INCO) built the Superstack in 1972 to disperse sulphur dioxide (SO2) and other pollutants away from the area, thereby addressing health and environmental concerns. The Stack’s construction coincided with a community regreening movement, which has reversed some of the environmental damage. 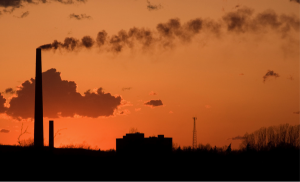 The Superstack reduced local emission rates in recent years, but one could argue that INCO simply passed the buck, and the dispersion of SO2 became somebody else’s problem. Moreover, the Sudbury area continues to have higher rates of asthma and lung cancer than other parts of Ontario. For better or for worse, the Superstack has been a landmark along the Sudbury skyline for over forty years. 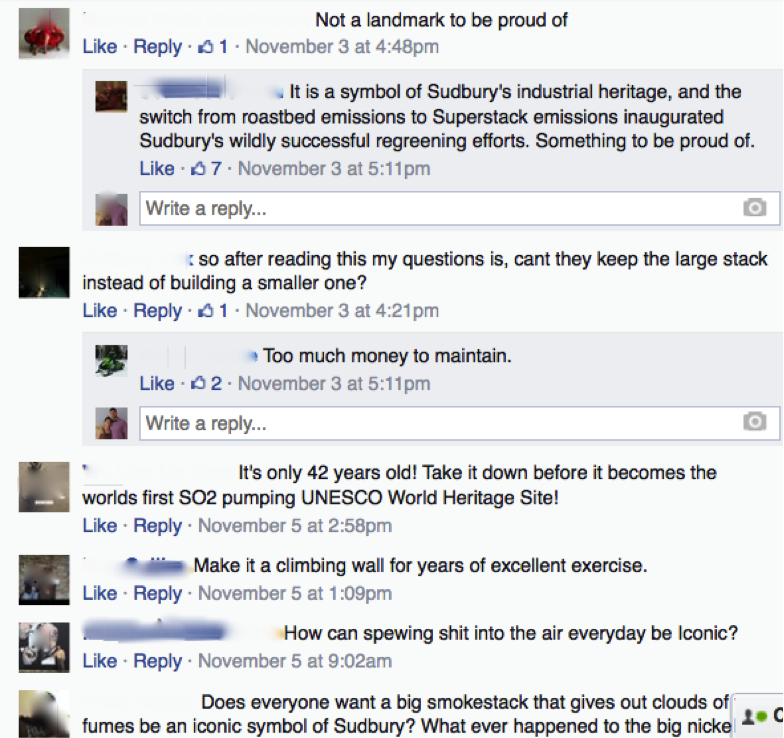 And when Vale (formerly INCO) recently proposed demolishing the Superstack in the local media, we watched as an interesting public debate about the significance, history, and future of the stack ensued. On November 3rd 2014, Kelly Strong of Vale announced that the company considered demolishing the Superstack. This news is not surprising and is in keeping with Vale’s ongoing $1 billion Clean AER Project, designed to reduce SO2 emissions. If the Superstack is removed it will be replaced by a smaller chimney, but this will mark a big departure not only in the company’s operational history, but for local history as well. We realized that as historians, we can help curate and analyze the varying memories and opinions people shared about the Stack. A brief snapshot of the conversation on the Northern Life’s Facebook page reveals that many Sudburians have a strong connection with the Superstack. While several people questioned whether the Stack deserved to be classified as an iconic landmark, a great deal more believed it represented a part of Sudbury’s history and it should be preserved. Source: Mike Commito, Screenshot from Northern Life’s Facebook page, Nov. 3, 2014. Sudburians argued that the Superstack was a beacon of homecoming; seeing the Stack jutting out of the skyline filled them with a sense of nostalgia and the realization that they were home. Commentators also noted that the Stack is often used by residents and outsiders to locate Sudbury. Some might say, “oh, you’re from the city with the giant smoke stack,” or, “Sudbury has the Superstack, right?” Not only do locals identify the Superstack with ‘home,’ but residents and visitors also use it to situate themselves in place. The potential absence of the Superstack as a physical reference point along the Sudbury horizon could create a (harmless yet interesting) sense of loss and dislocation for some. We found that the Stack is also a site of memory used to recall family histories. 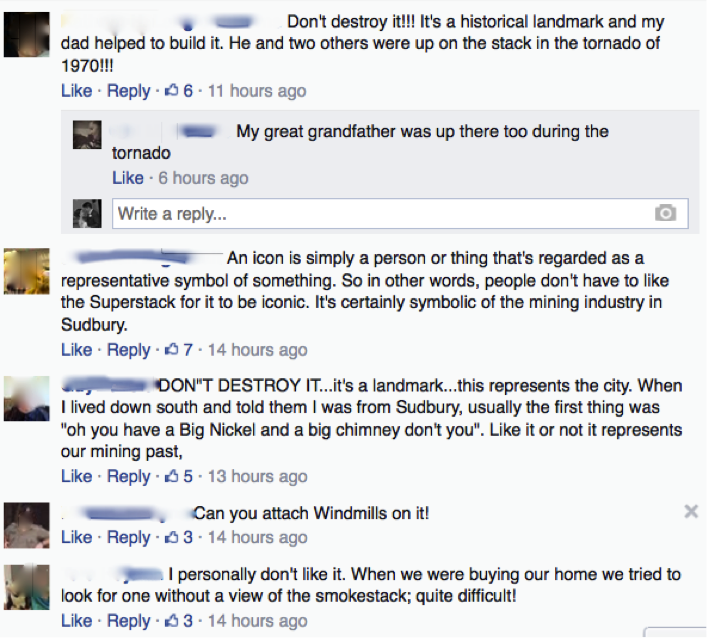 Residents fondly recounted memories of their parents or grandparents building the Stack, while others boasted of their relatives surviving Sudbury’s August 1970 tornado from high atop the chimney. The Stack is also a marker that roots blue collar workers and their families in place. It is an archive that embodies histories of work and family. In the Northern Life, Jonathan Migneault refered to the Stack as both an eyesore and an iconic landmark. Is the Stack nothing more than an industrial remnant? Deindustrialization is not just an economic process but a social one as well. The demolition of industrial sites are complex and emotional events for locals, especially for individuals who worked for decades in a single-industry town. Although the Stack is technically still functional, its replacement with a smaller chimney would mark the end of one era and the beginning of another. Historian Steven High studied the sense of loss and dislocation experienced by residents of Sturgeon Falls, Ontario, who struggled with the closure and demolition of their paper mill in the early 2000s. “What happens to a mill town that loses its mill?”, High questioned. High discovered that a part of local identity and history was lost when the paper mill was demolished. The physical absence of the mill served as a poignant reminder that prosperous times had come and gone in Sturgeon Falls. 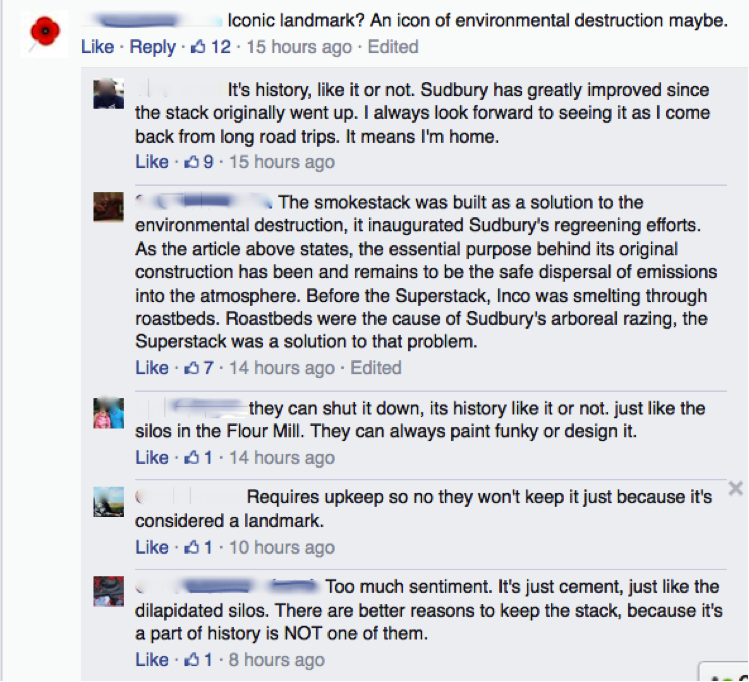 What will happen to Sudbury if it loses its Superstack? As the Sudbury economy continues to diversify, shifting away from mining towards other industries, its industrial landscapes will be renegotiated, rebuilt, or perhaps erased. Beyond the social media debates, the image of the Superstack boasts economic value for members of the community who use it to brand their products and services. Sudbury craft brewers Stack have tasted success, largely because of their quality beers, but also due to their savvy marketing campaign. Stack’s brand is aimed at a new generation of local consumers who embrace the Superstack somewhat nostalgically. The Stack brand evokes notions of home, nostalgia, and local identity for Sudburians, with beers labeled “Black Rock” (Sudbury is notorious for its black rocks, a product of nickel smelting), “Valley Girl” (based on the”valley” communities on the outskirts of Sudbury, such as Hanmer and Chelmsford), and “Saturday Night” (a nod at Stompin’ Tom Connors’ song, Sudbury Saturday Night). The Superstack is an oddity, a symbol of pollution and environmental damage, and an eyesore for a lot of people. But this giant chimney also holds complex and sometimes competing meanings to many generations of Sudburians. What is clear is that the significance of the Superstack transcends its industrial function. It will be interesting to see what Vale decides in the coming months and how this will be received by Sudburians. Since Strong’s announcement, the Sudbury Star polled readers about the potential demolition; fifty-nine percent said they would not miss it, while thirty-eight said they would, and three percent were unsure. Will we see “Save our Stack” petitions circulating, or will the response be more muted? Whatever the case, as historians, we might enter the debate, but we will also strive to observe and listen to the memories, stories, and meanings that are attributed to the infamous Superstack. Steven High. “Narrating the Displaced Worker: Narrating Place in Deindustrializing Sturgeon Falls, Ontario”, in Placing Memory and Remembering Place in Canada, James Opp and John C. Walsh, eds. Vancouver: University of British Columbia Press, 2010. Steven High and David W. Lewis. Corporate Wasteland: The Landscape and Memory of Deindustrialization. Toronto: Between the Lines Press, 2007. Kaleigh Bradley is a PhD Candidate in the Department of History at York University and an Editor at ActiveHistory.ca. She is also a Sudburian expat living in Toronto. Mike Commito is a PhD candidate in the Department of History at McMaster University. His dissertation focuses on the history of the relationship between humans and black bears in Ontario. Mike resides full-time in Sudbury with his wife, Chantal, and is currently teaching part-time in the Department of History at Laurentian University. A well written work, great job! Fascinating stuff, Mike and Kaleigh. For my own interests, it shows the importance of places like Facebook for debates about the past – and my own worries that if we don’t harvest this material now we won’t have access to it in the future (i.e. some historian in the future researching the Superstack might be relying on your screenshots). Even though Northern Life’s Facebook Page is open, it can’t be included in the Internet Archive. Thanks, Ian! I agree with you that these debates are important as an archive. Thanks, again Ian! I agree with you on that as well. I’ve been incorporating social media debates in my own research as well. To analyze the spring bear hunt debate in the 1990s I’ve had to FIPPA hundreds of letters but now with the advent of social media sites like Facebook and Twitter, I’ve been able to access public commentary about the current spring bear hunt debate (Nov 2013-present) through these forums as well. Kaleigh’s got the link above so we’re good to go! Well written article. Growing up in Copper Cliff, I remember the pre-Superstack days of lung choking sulphur in the air and watched the stack go up from our back yard. Whatever they do, I hope the air stays clean. The stack is also a great windsock! Hi Doug, thanks for sharing. My parents and grand-parents used to tell me stories about those days. My father used to play as a child in the slag hills near the Donovan. There’s something really strange and moving about the nostalgia people feel towards the building of the stack and “those good ol’ days” when the air was much more polluted. I agree and I hope too the air stays clean if it comes down! Thanks for your feedback Bruce! As to your point about clean air, Vale’s $1 billion Clean AER project is scheduled to be completed in 2018. When it if finished the plan is that SO2 emissions will be reduced by 85%. Right now the furnaces send their gas to the sulphuric acid plant where it is recaptured, the converters send their gas up to the Superstack. As part of Clean AER, all gases will be sent to acid plants from both the converters and furnaces. Ultimately, the Superstack will be need to be replaced by a newer, smaller chimney but that will, likely, be used for emergency bypasses when the acid plants may be down for maintenance or whatever reason. But no permanent gas (SO2 or otherwise) is expected coming out of the stack after Clean AER is completed.